Murphy greets a new visitor to Yeatman’s Cove Park. There is a new addition to the park today. We discovered Mr Red, sitting on a newly installed bench emblazoned with the 150th Reds Celebration logo. 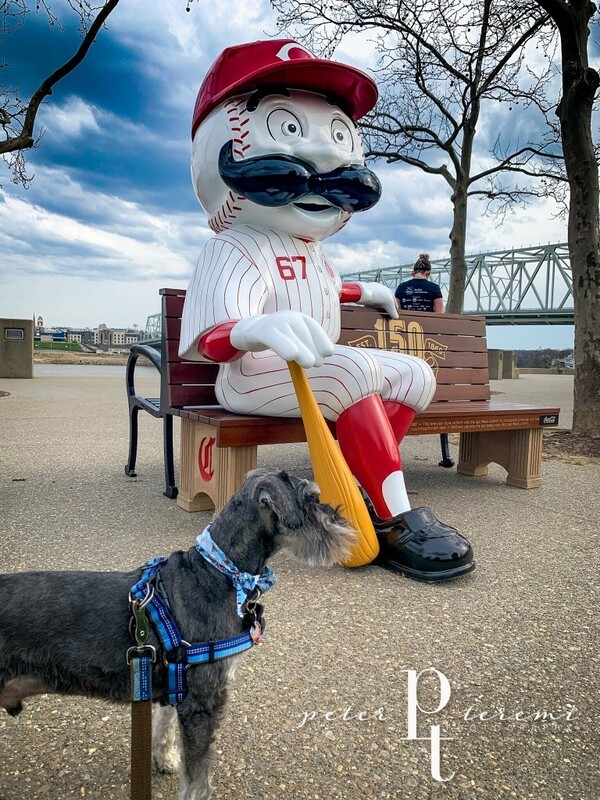 Murphy was not the only interested party, as folks walking through the park stopped for a photo-shoot with the Cincinnati icon. I discovered that there are 14 benches planned around the city, each with Mr Red in various incarnations of uniforms worn by the Cincinnati Reds baseball team over the last century and a half. Enjoy these Easter eggs as you visit local parks, they will be here through October. TGIF from The Murphy-Cam Project!